Nonpracticing entities won one and lost one this week. In High Point, the panel rules that High Point, which acquired the patents at issue for $2 million, is barred by equitable estoppel from asserting the patents against Sprint and related companies where High Point's predecessors helped defendants build the accused communication system. In HP the panel affirms the Board's IPR ruling that there is no anticipation as to one of the many patent claims at issue. This ruling enables the NPE MPHJ to proceed against the 16,465 businesses against which it has asserted a patent directed to the use of printers and scanners to scan a document and send it to an email address. ‎In Cardpool, the Circuit rules that even though the defendant prevailed in invalidating all original claims of a patent, Cardpool may be able to proceed with enforcement of different claims that survived an ex parte reexamination. In the early 1990s, AT&T's Bell Labs developed and patented the four patents covering the transfer of packetized voice traffic between cellular base stations and switching centers. The patents-in-suit issued between 1993 and 1994 and expired in 2011. In 1996, AT&T spun off Lucent Technologies as an independent company and assigned the patents-in-suit to Lucent. In September 2000, Lucent reorganized and spun off part of its business, including the patents-in-suit, to Avaya, Inc. In March 2008, Avaya sold the patents-in-suit for $2 million to High Point, reserving an interest in any proceeds High Point obtained through litigation. High Point is based in Luxembourg and does not practice the patents-in-suit. Within three days of taking ownership of the patents-in-suit, High Point began sending demand letters asserting infringement. Sprint and its affiliates were among many to receive such letters. As early as 1995, Sprint decided to build a network based on a new technology called Code Division Multiple Access ("CDMA"). CDMA allows a large number of cell-phone users to share the same radio frequency by associating each user with a single code. CDMA is now standard and used around the world. In September 1995, Sprint met with several vendors, including AT&T, Nortel, and Motorola, to discuss interoperability standards for its nascent network. To build the nationwide CDMA network, Sprint contracted with several vendors to supply equipment for the network. In 1996, Sprint executed a supply agreement with Nortel for equipment for the CDMA infrastructure. In 1997, Sprint executed a similar agreement with Motorola. In 1996 and 1999, AT&T (and later Lucent as AT&T's successor) agreed to supply Sprint with equipment. Each of the supply agreements with AT&T and Lucent had a limited license for several patents, including the patents-in-suit. In 1998, Sprint and Lucent entered into a memorandum of understanding in which Lucent represented a desire to work with Sprint and other vendors to develop interoperability standards. That same year, Lucent entered into a similar licensing arrangement with Nortel, which was later cross-licensed to Sprint. In 2000, Sprint and three of its infrastructure vendors (Lucent, Nortel, and Motorola) signed another agreement about interoperability. That agreement did not grant Sprint, or any of Sprint's vendors, rights under the patents-in-suit, but the agreement manifested each vendor's commitment to develop jointly interoperability standards, including an understanding that the equipment should work among and between vendors. Avaya succeeded in interest to Lucent in 2000, but Avaya did not discuss with any of the involved parties the patents-in-suit in an infringement context. At the inception of the Sprint network, all Sprint zones in the network were covered by a license, either by the license contained in the Lucent-Sprint supply agreement or a cross-license that originated from an agreement with Lucent and Nortel (which applied to Sprint's use of Nortel equipment). As the Sprint network grew, Sprint began to purchase and use unlicensed equipment supplied by several vendors. In 2001, Samsung won a bidding process—over Lucent, Motorola, and Nortel—to support Sprint's operations in Puerto Rico. Bidding began in 1999, when Lucent was still patentee. It is undisputed that the Puerto Rican operation involved the installation of unlicensed infrastructure provided by Samsung. In 2004, Sprint began upgrading some of the Lucent equipment with equipment provided by Motorola. Motorola was not a party to the Lucent-Sprint licensing agreement. In 2006, Alcatel purchased Lucent, naming the subsidiary Alcatel-Lucent USA, Inc. ("Alcatel-Lucent"). According to High Point, that act terminated any license as to Sprint's use of Lucent equipment. In 2008, Nortel began selling equipment to Sprint and others. At that point, Nortel was no longer a licensee to the patents-in-suit. The record does not reflect that at any time prior to December 2008, High Point, Avaya, or Lucent raised any infringement concerns. On December 29, 2008, High Point sued Defendants, accusing Defendants of violating the licensing agreements and alleging that the Sprint CDMA network operated through the combination of licensed and unlicensed equipment to facilitate the transmission of voice call traffic in an infringing manner. While the lawsuit was pending, Sprint continued to build its network by, among other things, entering into a supply agreement with Alcatel-Lucent under terms similar to those entered into with Sprint's prior vendors. On February 8, 2013, Alcatel-Lucent intervened as a defendant. Defendants moved for summary judgment on a variety of issues, including laches and equitable estoppel. After reviewing a special master's findings and recommendation, the district court granted summary judgment that laches and equitable estoppel barred the lawsuit, and dismissed High Point's claims. (1) the patentee, through misleading conduct (or silence), leads the alleged infringer to reasonably infer that the patentee does not intend to enforce its patent against the alleged infringer; (2) the alleged infringer relies on that conduct; and (3) the alleged infringer will be materially prejudiced if the patentee is allowed to proceed with its claim. Radio Sys. Corp. v. Tom Lalor & Bumper Boy, Inc., 709 F.3d 1124 (Fed. Cir. 2013). Although certain facts remain contested in this case, resolution of equitable estoppel rests on a record without material dispute. First, we conclude that High Point's predecessors' misleading course of conduct caused Sprint to reasonably infer that they would not assert the patents-in-suit while Sprint purchased unlicensed infrastructure to build its network. Misleading conduct occurs when the alleged infringer is aware of the patentee or its patents, and knows or can reasonably infer that the patentee has known of the allegedly infringing activities for some time.A.C. Aukerman Co. v. R.L. Chaides Constr. Co., 960 F.2d 1020 (Fed. Cir. 1992) (en banc). If the record indicates silence alone, mere silence must be accompanied by some other factor which indicates that the silence was sufficiently misleading as to amount to bad faith. The evidence set forth above shows both silence and active conduct. There is no genuine dispute of material fact that High Point's predecessors failed to challenge Sprint when its activity fell outside the licenses as early as 2001. The effect of equitable estoppel is a license to use the invention that extends throughout the life of the patent. That effect can arise when a predecessor's conduct is imputed to its successors-in-interest. Second, we agree with the district court that Defendants detrimentally relied on the conduct of High Point's predecessors. The district court did not abuse its discretion in admitting and crediting the unrebutted deposition testimony of Sprint's witnesses, indicating that Sprint had several options when building its network and that Sprint would have acted differently if the threat of litigation was a possibility. High Point fails to rebut with evidence that Sprint's proposed solutions would have been unrealistic or infeasible. Whether inside or outside the licensing arrangements, Sprint systemically worked to build a network while High Point's predecessors continued to sell to Sprint equipment and negotiate the interoperability that High Point would come to allege constituted unlicensed infringing activity. Finally, the district court did not err in finding that Defendants suffered prejudice from the delay. There is no dispute that Sprint—as early as 1996—worked to build a CDMA network at significant cost, totaling billions of dollars. The district court did not err in finding evidentiary prejudice because the unrebutted evidence demonstrated that information about the inventor, which could have been used for a variety of defense theories, was fading or is already absent. High Point failed to present evidence to rebut the economic and evidentiary prejudice showing made by Defendants. Hewlett-Packard appeals from the final decision of the PTAB in an IPR finding all but one of the claims of a '381 patent, owned by MPHJ, unpatentable as anticipated. HP argues that the Board erred by not finding the remaining claim 13 unpatentable as anticipated, and challenges the Board's decision not to review whether claim 13 is unpatentable as obvious. Because the Board did not err and because we cannot review the decision not to institute, we affirm. MPHJ is the owner of the '381 patent, directed to a method and system that "extend the notion of copying. . . to a process that involves paper being scanned from a device at one location and copied to a device at another location." Claim 13 requires, inter alia, a list of available modules, including input, output, and process modules. After acquiring the '381 patent, MPHJ sent letters to numerous small businesses, alleging that those businesses likely infringed the '381 patent, among others. As "a good example of an infringing system," the letter described a scanner connected to a local area network in communication with a server, whereby an employee could scan documents at the scanner and have the documents sent to the employee's email address. Because the letters were sent to users of HP's multifunction printers, HP petitioned for IPR of the '381 patent, alleging that all of the claims were unpatentable either as anticipated or as obvious. HP alleged seven grounds of anticipation and one ground of obviousness. This appeal only implicates three grounds: Ground 1, that all claims are unpatentable as anticipated by HP ScanJet 5 Scanner User's Guide ("SJ5"); Ground 6, that all claims are unpatentable as anticipated by a patent to Cotte; and Ground 8, that claims are unpatentable as obvious over an HP ScanJet 5 Press Release describing the SJ5 scanner ("SJ5PR"), in view of SJ5. The Board instituted review of all of the claims of the '381 patent, finding that HP established a reasonable likelihood that the claims were unpatentable as anticipated by either Cotte or SJ5. The Board declined to institute review based on the other asserted grounds of unpatentability, concluding that "the additional grounds are . . . redundant in light of the determination that there is a reasonable likelihood that the challenged claims are unpatentable based on the grounds of unpatentability on which we institute an inter partes review." As authority for denying review based on redundancy, the Board cited 37 C.F.R. § 42.108(a), which provides that "when instituting inter partes review, the Board may authorize the review to proceed on all or some of the challenged claims and on all or some of the grounds of unpatentability asserted for each claim." In the final written decision, the Board found all of the claims other than claim 13 anticipated by Cotte. The Board found that Cotte did not anticipate claim 13 because HP did not establish that Cotte disclosed the claimed list of available module means. The Board also ruled that claim 13 was not anticipated by SJ5 because HP did "not specify clearly how SJ5 discloses all the recited and argued elements" because HP did not "specify the required lists of modules." Accordingly, the Board found that HP had not met its burden of establishing the unpatentability of claim 13. "Anticipation is a question of fact reviewed for substantial evidence." In re Rambus, Inc., 753 F.3d 1253 (Fed. Cir. 2014). HP argues that the Board did not consider all of the evidence presented, and that therefore the Board's findings are not supported by substantial evidence. Specifically, HP argues that although the Board asserted that HP's arguments relating to claim 13 were a repetition of the arguments HP had made with respect to claims 1, 2, and 7, HP had also referenced arguments and evidence presented relating to claim 9. Because the Board did not address those arguments, HP argues, it asks that the Board's decision be reversed. HP also argues that SJ5 does teach the "list of available module means" and so the Board's finding to the contrary is not supported by substantial evidence. HP reasons that because a preferred embodiment of the '381 patent teaches that the Windows registry contains the list of available modules, and SJ5 teaches using "lists of destinations, workflows, and the like that are started automatically when Windows is started," SJ5 reads on the "list of available module means" limitation. We agree with MPHJ that the Board fully considered all of the evidence that HP presented. Although the Board decision does not directly state that it considered the evidence relating to claim 9, that evidence is almost identical to the evidence that HP presented with respect to claim 13. As the Board stated, the evidence regarding both claims "generally refers to the analysis of claims 1, 2, and 7." The only evidence listed in the treatment of claim 9, but not listed in the treatment of claim 13, is pages 33, 34, and 114 of SJ5. Those pages of SJ5 are cited in paragraph 132 of HP's expert report, however, and paragraph 132 is listed in the treatment of claim 13. Accordingly, the Board did consider the evidence that HP alleges had been neglected. Moreover, review of SJ5 reveals that the Board's finding that it does not teach a "list of available module means" is supported by substantial evidence. HP's petition does not specifically identify what it views as the input, output, and process modules. The only "lists" HP identifies are "lists of destinations, workflows, and the like," and the evidence presented does not equate destinations or workflows with input, output, or process modules. As the Board noted, even at oral argument HP "was unable to specify the relevant names for the process or server modules appearing in a list or lists recited." Given this evidence, the Board did not err in finding that SJ5 did not teach the required "list of available module means." HP also challenges the Board's refusal to institute review on the basis that HP's obviousness ground in the petition was redundant in view of the instituted anticipation grounds. Before reaching the merits of HP's argument, we must first address whether we have jurisdiction to consider the argument at all. Under 35 U.S.C. § 314(d), "the determination by the Director whether to institute an inter partes review under this section shall be final and nonappealable." HP argues that § 314(d) does not prevent our review of the issue of redundancy because the "under this section" language means that only determinations made under § 314 generally are immune from review. The panel rejects this argument, citing Achates Reference Publishing v. Apple Inc., where the Circuit specifically rejected as "crabbed and . . . contradicted by this court's precedent" the argument that the "under this section" language in § 314(d) limited the bar on review. 803 F.3d 652 (Fed. Cir. 2015). Moreover, we have found that § 314(d) bars our review of aspects of the institution decision other than the § 314(a) determination whether there is a reasonable likelihood that the petitioner would prevail. SightSound Techs., LLC v. Apple Inc., 809 F.3d 1307 (Fed. Cir. 2015) (refusing to review Board's consideration of obviousness in the final decision despite not being raised in the initial petition); Achates, 803 F.3d at 658 (refusing to review the Board's assessment of the time-bar provisions of § 315(b)); In re Cuozzo Speed Techs., LLC, 793 F.3d 1268 (Fed. Cir. 2015), cert. granted(refusing to review the Board's decision to institute review of certain claims on the basis of prior art not asserted regarding those claims). Indeed, we recently held that § 314(d) bars our review of the Board's decision not to institute IPR on redundancy grounds. See Shaw Indus. Grp., Inc. v. Automated Creel Sys., Inc., Nos. 15-1116, 15-1119 (Fed. Cir. Mar. 23, 2016); Harmonic Inc. v. Avid Tech., Inc., 2016 WL 798192 (Fed. Cir. Mar. 1, 2016). HP next argues, citing Versata Dev. Grp., Inc. v. SAP Am., Inc., 793 F.3d 1306 (Fed. Cir. 2015), that § 314(d) does not bar review of this case because we can review "whether the Board has properly construed the scope of its authority." The panel rules that Versata does not require us to review the Board's institution decision in this case. Versata explained that review was proper in that case because the CBM determination was the "defining characteristic" of the Board's "authority to invalidate" the patent. Accordingly, in Achates we concluded that Versata did not permit review of the Board's application of the § 315(b) time bar because the time bar did "not impact the Board's authority to invalidate a patent claim—it only bar[red] particular petitioners from challenging the claim." In that case, the patent could still be challenged "via a properly-filed petition from another petitioner." HP next argues that the Board does not possess the authority to institute review only on a subset of the grounds presented in the petition for review. Harmonic addressed whether we could review the Board's decision to institute review on some, but not all, of the grounds presented in a petition. There, we noted that our prior decisions prohibited review of both the decision to institute an IPR and the decision not to institute an IPR. Harmonic (citing Cuozzo). As the decision to institute on a subset of grounds was "simply a combination of the two," we concluded that we could not review that decision. Accordingly, Harmonic dictates that § 314(d) bars our review of the decision to institute on only some grounds. We also recently addressed whether the Board is required to address all grounds presented in the petition for review, including the grounds on which IPR was not instituted, in its final written decision. Synopsys, Inc. v. Mentor Graphics Corp., No. 14-1516, 2016 WL 520236, at *3-5 (Fed. Cir. Feb. 10, 2016). Relying on the statutory text, we concluded "that the Board need only issue a final written decision with respect to claims on which inter partes review has been initiated and which are challenged by the petitioner after the institution stage." HP next challenges whether the Board fulfilled its obligations under the Administrative Procedure Act ("APA"). Specifically, HP argues that the Board did not fulfill its APA obligations because it did not address all of the grounds in the petition in its final decision. The Board met its obligations under the APA. As we have previously explained, "during the institution phase of the IPR, the Board establishes parameters that confine the proceeding during the merits phase." Harmonic. Accordingly, "under the PTO's regulations, grounds not instituted never become part of the merits phase of the IPR proceeding." Finally, HP argues that the Board did not sufficiently articulate the reasons for its redundancy conclusion under the APA. This issue is reviewable, HP argues, due to the strong presumption of judicial review of agency action. We agree with the Director that § 314(d) prevents our review of the Board's reasons for its redundancy determination. Allowing an APA challenge to the Board's decision to institute on the basis that the Board had insufficiently articulated its reasoning would eviscerate § 314(d) by allowing substantive review of the institution decision. HP expresses concern that it will be estopped from challenging claim 13 in a future proceeding. As we explained supra, however, the noninstituted grounds do not become a part of the IPR. Accordingly, the noninstituted grounds were not raised and, as review was denied, could not be raised in the IPR. Therefore, the estoppel provisions of § 315(e)(1) do not apply. See Shaw. Accordingly, we cannot review the Board's refusal to institute IPR on redundancy grounds, and we find that the final written decision meets the agency's obligations under the APA. Cardpool sued Plastic Jungle for infringement of its patent directed to online gift card exchanges. Plastic Jungle argued that the claims were obvious and that the claims were patent-ineligible under § 101. The district court agreed as to ineligibility under § 101, and on this ground granted Plastic Jungle's motion to dismiss the suit with prejudice under Rule 12(b)(6). Cardpool appealed that ruling on February 12, 2013. Before that appeal was decided, in June 2013 Cardpool filed a request for ex parte reexamination, presenting unamended, amended and additional claims. Cardpool provided the PTO with the invalidity contentions made by Plastic Jungle before the district court, and reexamination was ordered by the PTO. Before reexamination was completed, on January 30, 2014 the Circuit affirmed without opinion the district court's judgment of ineligibility under § 101. On February 6, 2014, the PTO issued a notice of intent to issue an ex parte reexamination certificate, holding amended and new claims patentable under § 103. See 37 C.F.R. § 1.552 (§ 101 eligibility is not considered on reexamination). Cardpool then filed a petition for rehearing of the Circuit's decision of January 30, 2014, because the claims that were the subject of that decision no longer existed. Cardpool argued that not doing so would create the improper ruling that an intervening final PTO decision is not controlling of a still pending District Court case—directly in conflict with Federal Circuit precedent. Plastic Jungle, in response to the request for rehearing, argued to this court that the entire case is moot because the reexamination "substantially changed" the claims at issue, requiring that the prior rulings must be vacated and the case dismissed. Cardpool replied that, while the district court's decision of § 101 unpatentability had been rendered "moot" by the reexamination, the underlying cause of action was not moot because infringement might be renewed by Plastic Jungle or a successor. Cardpool stated that the validity of the reexamined claims had not been evaluated by any court, and asked that the district court decision of invalidity be vacated as moot. The Federal Circuit granted rehearing, vacated its summary affirmance of § 101 invalidity, and remanded to the district court to determine what actions, if any, are appropriate in light of the reexamined claims. However, the Circuit declined to vacate the district court's invalidity judgment of January 22, 2013, stating that "it would not be appropriate in this context to vacate the district court's judgment because Cardpool, the losing party below, caused the change in circumstances." On return to the district court, Cardpool and Plastic Jungle jointly moved the district court to vacate its prior judgment so that the parties could move for a voluntary dismissal without prejudice under Rule 41(a)(1)(A)(ii). The parties stated that Plastic Jungle was no longer in the business of computer-implemented online gift card exchange, that Cardpool questioned Plastic Jungle's solvency, and that Cardpool did not believe the case was necessary at that time. The parties also jointly stated that they were not seeking to vacate the Court's Order finding the unamended claims invalid. Rather, they requested that the Court vacate the judgment because the prior Order no longer applied because the claims on which that Order was based were now different. Cardpool filed a separate brief to the district court, stating that while the basis for the district court's prior invalidity judgment was mooted by the changed claims on reexamination, the "entire case" is not moot because it might become necessary in the future to enforce the reexamined patent against Plastic Jungle (or a successor), should infringing activity reoccur. Cardpool asked the court to "either (1) vacate its dismissal with prejudice to allow the parties to dismiss without prejudice; or (2) vacate the dismissal to the extent that it was with prejudice and dismiss this case without prejudice." Cardpool told the court that the case was not "settled"—although the court had so stated—and argued that vacatur of "with prejudice" was appropriate because the "final PTO judgment" on reexamination was issued before "the appellate mandate that would have finalized the interim district court decision," citing the authority of Fresenius USA, Inc. v. Baxter Int'l, Inc., 721 F.3d 1330 (Fed. Cir. 2013), in which this court held that a final PTO decision affirmed by this court should be given effect in pending infringement cases that are not yet final, and is not affected by a subsequent final court ruling contrary to the PTO ruling. Cardpool told the district court that if the "with prejudice" quality of the judgment of invalidity of the original claims were not vacated, Cardpool may lose the right to file a new case at any time against Plastic Jungle asserting the reexamined claims. The district court declined the requested vacatur, stating that Fresenius was distinguishable in that no Article III court had reviewed the Cardpool reexamined claims. "Since the mootness was due to a voluntary act by Cardpool (the losing party), vacating the final judgment is not appropriate." Cardpool again appeals, asking this court to vacate the district court's "with prejudice" judgment of unpatentability, stating that the parties had agreed and jointly moved for vacatur of the final judgment dismissing the case with prejudice, and further argues that the "with prejudice" aspect of the ruling is "superfluous" for the claims that had been before the district court no longer exist. Cardpool states that while the appeal of the unpatentability finding had become moot, the civil case was certainly still alive although it became financially unattractive. Plastic Jungle now opposes the requested vacatur, despite having joined in the motion for vacatur. Before we address the merits of Cardpool's arguments, we must reject several of Plastic Jungle's arguments as unsupported or estopped. Although the record shows Cardpool's request that the district court review the reexamined claims if disinclined to grant vacatur, Plastic Jungle states that Cardpool "steadfastly refused to demonstrate to the district court why its new and amended claims are valid under section 101." This statement is not readily reconciled with Cardpool's brief to the district court, which stated that "if the Court is inclined to apply its prior invalidity decision to the amended reexamined claims in justification of not vacating its dismissal, such a determination must not be done in a cursory manner but with a full opportunity of the parties to provide briefing and argument." Plastic Jungle's prior statements to this court were that "the entire case was mooted," that "this cause of action is extinguished—neither party appears to dispute that," and that "all causes of action stemming from the reexamined patent are necessarily mooted." Plastic Jungle is judicially estopped from taking this change of position, on which this court relied in remanding to the district court. The parties mutually agreed to discontinue this litigation because the accused activities had been voluntarily terminated by Plastic Jungle. The only issue on appeal arises from Cardpool's concern that it not be estopped from acting in the future against any infringement upon the new reexamined claims. The district court based its denial of the motion to vacate or change the finality of its decision on straightforward principles of judicial process. Federal courts are precluded from deciding questions that cannot affect the rights of litigants in the case before them. Whenever an action loses its "character as a present live controversy" during the course of litigation, federal courts are required to dismiss the action as moot. Here the district court's decision was final and had been affirmed on appeal before the PTO's reexamination decision. The district court violated no legal right in preserving its original decision, which is limited to the claims and grounds that existed. Dismissal "with prejudice" operates as res judicata as to the same cause of action. How this rule of finality would apply to changed circumstances depends on the factual circumstances of the specific situation. On the facts and procedures of this case, the issue of validity of the reexamined claims remains to be addressed in any future proceeding. In the initial proceeding the original claims were adjudicated only on the ground of subject matter eligibility under § 101. The effect of a prior judgment rendered on specific issues as applied to the original claims depends on the facts and issues of the reexamination, and invokes equity as well as law. The district court correctly deemed it inappropriate to advise on the new claims, in a case that the parties agreed was moot. The district court did not abuse its discretion in denying the motion to vacate its judgment or the finality thereof. That judgment is affirmed. Pride Mobility owns the '598 and '343 patents directed to wheelchairs designed to travel stably over obstacles. A competitor, Permobil, petitioned for IPR of the patents and in a final written decision the Board cancelled all claims of both patents for obviousness. Pride Mobility's appeal centers on two issues: (1) whether the Board misconstrued claim 7 of the '343 patent, which requires a "substantially planar" mounting plate "oriented perpendicular" to the axis of the claimed wheelchair's drive wheel; and (2), as to all other claims, whether the Board erred in concluding that a relevant skilled artisan would have been motivated to make the claimed wheelchair by lowering the position of a pivot in a prior-art wheelchair. We reverse the Board's construction and cancellation of claim 7 of the '343 patent. As to the other claims, we affirm. The '598 and '343 patents disclose wheelchairs that raise their front wheels (called caster wheels) in response to torque from the chairs' motors, enhancing the capacity of the chairs to travel stably over obstacles. 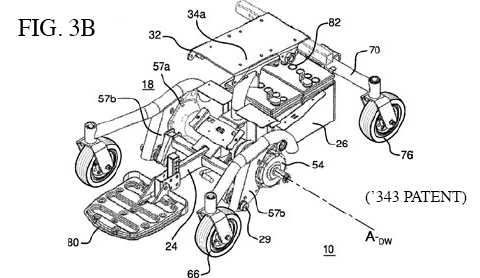 As shown in Figure 2, the '598 patent discloses a chair with a frame 3, a drive wheel 6 centered around drivewheel axis PA, a front caster wheel 16 centered around caster-wheel axis 16A, and an arm 24 connecting the front caster wheel to the frame, the arm itself connected to the frame by pivot axis 24A. Importantly, the pivot axis is below a straight line drawn between the drive-wheel axis PA and front-caster-wheel axis 16A. When the wheelchair accelerates or climbs a curb or other obstacle, the arm 24 rotates clockwise about the pivot axis, lifting the front caster wheel. The '343 patent discloses a chair that is similar in relevant respects. Figure 3B shows portions of the '343 patent's chair relevant to the issue presented by claim 7 of that patent. A part of each of a left and right drive assembly (not numbered in Figure 3B) is a mounting plate (number 56 in other Figures), a portion of which is shown in Figure 3B as 57b. That part of the mounting plate contains a pivot 29. The plate connects at its top to the roughly horizontal (slightly bent) front arm (numbered 60 in other Figures), which in turn connects to a caster wheel 66. As in the '598 patent's chair, the relevant pivot of the '343 patent's chair is positioned below a line drawn between the chair's drive-wheel axis A-DW and the front-caster-wheel axis (not numbered). Permobil filed petitions for inter partes review of the '598 and '343 patents, arguing that the wheelchairs of all claims of the '598 patent would have been obvious over Goertzen in view of Hosino and Schaffner. Permobil also argued that the wheelchairs of all claims of the '343 patent would have been obvious over Goertzen in view of Hosino and Mulhern. The Board instituted IPR of all claims of both patents, and in its final written decisions cancelled all of the claims. 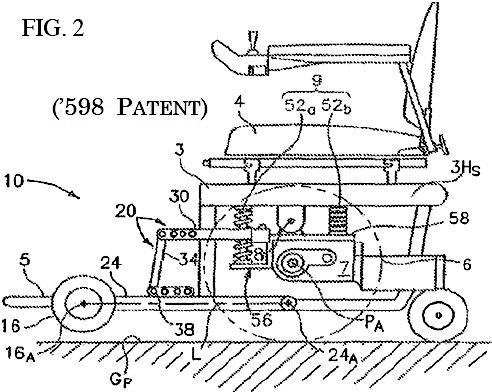 Pride Mobility appeals, challenging the Board's construction of claim 7 of the '343 patent and the cancellation of the '598 and '343 patents' claims. We first review the Board's construction and cancellation of claim 7, which requires a "mounting plate that is substantially planar and is oriented perpendicular to the drive wheel axis." It is unreasonable to read that straightforward language as meaning anything other than that the drive-wheel axis is perpendicular to the surface of the mounting plate that makes the plate substantially planar. In terms of simple geometry, if the plate were translated in space (without rotation) so that it intersected the axis, the axis would intersect the substantially planar surface at a single point (not more) and make a right angle. The claim language says two things about the plate: it must be substantially planar, and it must be oriented perpendicular to the drive-wheel axis. The "oriented" term allows the plate and axis not to be touching: it requires that their placement in space must be such that, if translated in space without rotation, they would be perpendicular. With the axis idealized as a line, perpendicularity in the ordinary geometric sense relevant here requires that the axis make a right angle with either an essentially one-dimensional feature (a line or curve) or an essentially two-dimensional feature (a plane or surface) of the plate: lines are not "perpendicular" to a three-dimensional object in any other ordinary geometric sense. And the claim tells us exactly what that feature of the three-dimensional plate is: it is the surface that makes the plate substantially planar. The claim identifies no other feature of the plate. The phrase "oriented perpendicular to the drive wheel axis" must be read to mean that the drive-wheel axis is perpendicular to the mounting plate's substantially planar surface. We do not see how the claim language can mean anything else without obvious strain. The specification reinforces this reading. In a first embodiment, the specification says that "mounting plate 56 preferably is planar and oriented perpendicular to the rotational axis C-DW of drive wheels 58." In the same passage, it points to Figures 3A, 3B, 4A, and 4B as "best showing" the components of mounting plate 56, including its projection 57b. Each of those figures shows projection 57b as having a planar surface oriented perpendicularly to the drive-wheel axis (A-DW) in the ordinary geometric sense. The specification likewise says that mounting plate 56 (of which 57b is a part) in a second embodiment "preferably is planar and oriented perpendicular to rotational axis CDW of drive wheels 58'," pointing to Figures 7A and 7B. Id., col. 13, lines 19-23. Both of those figures show the axis of the drive wheel oriented perpendicularly to the planar surface of the mounting plate. The specification nowhere describes or depicts the drive-wheel axis as oriented other than perpendicular to the planar surface of the mounting plate in the ordinary geometric sense. Under that construction, the Board's cancellation of claim 7 must be reversed. The sole prior-art reference that the Board (and Permobil) identified for this element is Goertzen. The pertinent component of Goertzen is substantially planar, but it is indisputably not perpendicular to the drive-wheel axis in the ordinary sense required by claim 7, and the Board did not find otherwise. The Goertzen plate, if translated without rotation to intersect the drive-wheel axis, would not intersect at a single point and make a right angle: indeed, the axis would likely lie flat on the plate. Accordingly, there is no evidence of the claim 7 element in the relied-on prior art. Because there is no other Board ruling or properly preserved argument addressed to this element, we reverse the cancellation of claim 7. As to all of the other claims at issue, we affirm the Board's decision. The Board found that a relevant skilled artisan would have been motivated to lower the pivot axis in the Goertzen chair in the way shown in Hosino. Pride Mobility challenges that finding, but it does not dispute that the finding, if sustained, suffices to support all of the rejections except for claim 7 of the '343 patent. We sustain the Board's finding. The Board had sufficient evidence to find that lowering the pivot axis "enables a front caster wheel to move 'rear upward' and thereby more easily rise up and overcome [an] obstacle" such as a curb. Based on its expert's evidence, however, Pride Mobility argues that a relevant skilled artisan would have recognized that obtaining the obstacle-climbing advantage would have come at the cost of introducing instability problems in the Goertzen chair and that adjustments of other components of the chair to compensate for instability would have introduced their own problems. But we read the Board as having found, and as reasonably understanding Dr. Richter to have testified, that a relevant skilled artisan would have "known to compensate for" the instability problem in ways that preserved the acceptability of the wheelchair. We need not go beyond saying that the findings and evidence, so understood, are sufficient to support the Board's rejection of Pride Mobility's argument against a skilled artisan's having had a reason to make the Goertzen-Hosino combination.